This doll was purchased on eBay from Maureen Fukishima in Hawaii. Her hair is in the original set and she's dressed in a rare tagged Alexander "Lady Churchill" outfit complete with original purse. She's just stunning. This beautiful unmarked doll came to me all dirty and her wig was becoming unglued and was coming apart. I sent her to Wanda Houck for a beauty makeover and this is what came back. An absolute beauty!! I dressed her in a fabulous original Sweet Sue organdy gown with blue accents from the 50's. Peggy Millhouse picked this girl up for me at the modern doll convention in Anaheim, Ca. She comes dressed her in an original tagged black cocktail dress with undergarments and original shoes. She is just perfect!. This doll was purchased from a dealer in New Jersey, complete with a trunk of tagged clothing. I cleaned her up, reset her wig, and put her in a tagged Hoyer bridal gown...complete right down to the bouquet. This platinum blonde was purchased from a woman here in Lancaster. Her hair was a mess, so her French wig was cleaned and put back into the original set. She's dressed in a tagged emerald green satin gown with organdy trim. 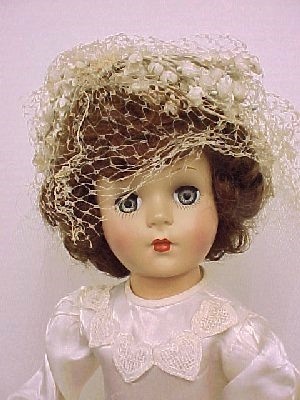 She was one of the original dolls in the Mary Hoyer fashion show. The dress was freshened by Carter & Jones in Virginia. This stunning doll was purchased at the Gaithersburg show in Maryland. Her French wig is in the original set with flawless matte makeup. She comes dressed in a light blue satin gown with tulle overdress made from a Hoyer pattern. Flowers accent her waist and hair. With box. 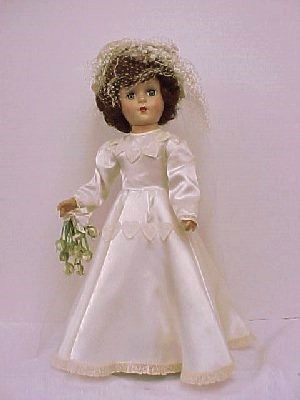 This doll came in her original box wearing this tagged Hoyer 2-piece negligee set and original metal stand. Her hair was freshened and the outfit is flawless and quite detailed. This doll was purchased at Black Angus Antique Center in Adamstown, Pa. She was filthy, her hair was matted and dirty, and the dress was dingy and crusted with dirt. I cleaned and reset her saran wig and freshened the dress. It's tagged and done in a lovely pink dotted swiss organdy with blue ribbon accents. She's just beautiful now. 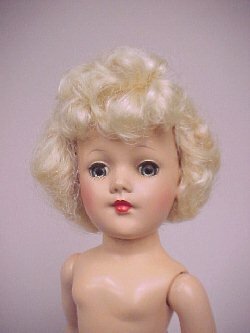 This doll has flawless makeup with high color cheeks. I restyled her hair and dressed her in a strapless gown from a Hoyer pattern. I used a vintage pillbox hat with veil for the stole, the waist ornament, and her veiled hat with feather accents. This beautiful redhead with the french wig was purchased in Sommerville, NJ. Her hair was wild and unruly, so off to Wanda Houck she went. Now her hair is set in the typical style of the 50's. She's dressed in a wonderful gown taken from an Effanbee Honey. Now she's ready for a night on the town. This beautiful doll with her red saran wig was sent to me from Florida. 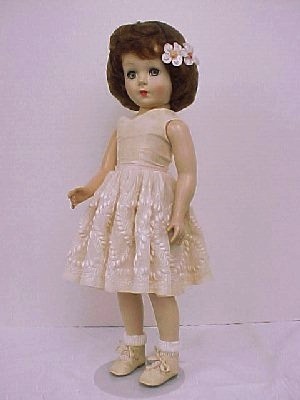 Her hair is in the original set and she's dressed in a vintage tagged cotton dress with embroidered French knots. This is a beautiful, unique, and rare outfit. 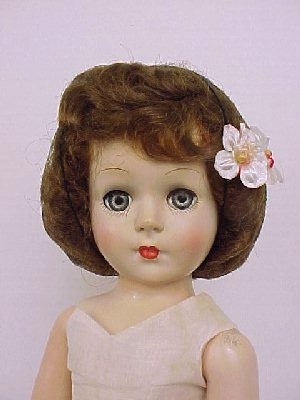 This is an unmarked doll but unmistakeably a Hoyer and was signed by Mary Hoyer herself. I cleaned and reset her French wig and then dressed her in a Madame Alexander Cissy corset and a long, silk dressing gown by Effanbee. This fantastic doll was purchased from Jan Foulke. Her hair and face are just flawless and she's all original and mint. Her dress had a few ink stains on the front, but due to my dilligence, they came out. This is a wonderful outfit. Unmarked but verified and signed by Mary Hoyer. This beauty came in her original box from June Verro in Lancaster, Pa. Her French wig is still in the original set and she's dressed in a tagged blue tafetta gown with organdy trim. The dress was sent to Carter & Jones to be freshened and came back factory fresh. Stunning doll with box. This blonde beauty was sent to me from a friend in California. Her hair is in the original set and I redressed her in a rare original Sweet Sue taffeta gown with gold trim & gold sandals. I just love the Sweet Sue clothing on these dolls. This rare doll was a fluke. A shipment of dolls with breasts got through without Mary Hoyers knowledge. She wanted to produce a play doll, not a fashion doll, but decided to use the dolls any way. She's dressed in a very rare outfit that was created from a blouse of Mary Hoyer's and is only 1 of 12. This rare outfit is tagged.